Just in time for the holiday season and the release of the highly-anticipated Walt Disney Animation Studios film, Frozen, Disney Consumer Products has launched a new product collection of role-play items, plush stuffed animals, dolls, apparel, home décor, books and more that capture the family, adventure and fun from the movie at mass retailers nationwide, Disney Store and DisneyStore.com. Disney's Frozen chronicles the epic quest of fearless optimist Anna as she teams up with rugged mountain man Kristoff and his loyal reindeer Sven to find her sister Elsa, whose icy powers have trapped the kingdom of Arendelle in eternal winter. Encountering Everest-like conditions, mystical trolls and a hilarious snowman named Olaf, Anna and Kristoff battle the elements in a race to save the kingdom. "Disney's Frozen product collection is inspired by the vivid storytelling driven by the family relationships and friendship celebrated in the movie," said Josh Silverman, EVP global licensing, Disney Consumer Products. "From musical dolls that sing when they hold hands to detailed role-play costumes, children will be able to celebrate these themes and reenact their favorite storylines with products that connect them to the characters in an authentic and immersive way." The wide assortment of products is available now from licensees including Mattel, Just Play and more at mass retailers nationwide. 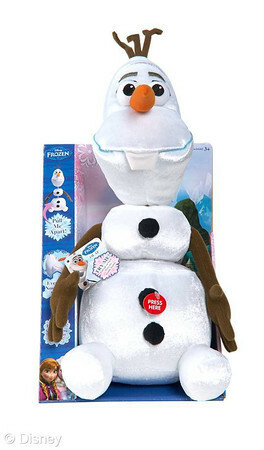 Products are also available at Disney Store and DisneyStore.com. 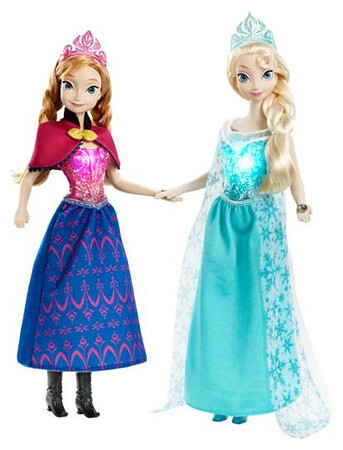 · Disney Frozen Musical Magic Elsa and Anna Dolls by Mattel (MSRP $29.99 each): Not only do these dolls feature glittery and glamorous gowns, but when you hold their hands, (or when they hold each other's hands), the dolls will magically light up and play enchanting music. 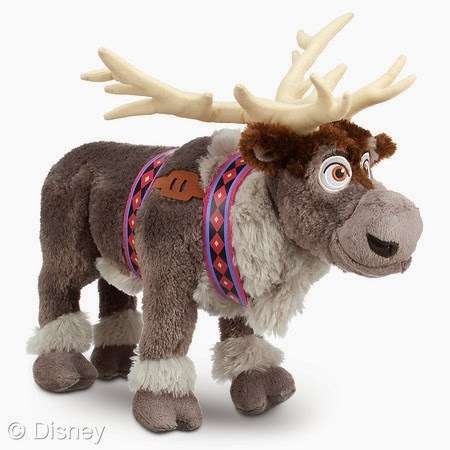 · Disney Frozen Pull Apart and Talkin' Olaf by Just Play (MSRP $17.99):Everyone's favorite snowman comes to life in this adorable pull-apart plush. Olaf's nose, head and torso all temporarily separate and then safely rejoin, recreating memorable moments from the film. Olaf also speaks, with funny phrases from the movie. · Disney Frozen Castle and Ice Palace Playset by Mattel (MSRP $99.99): This expandable set is double the storytelling fun with two gorgeous homes- Anna's castle and Elsa's Ice Palace. Children can enjoy all the movie-inspired furniture and play pieces, including a throne, bed, chaise, vanities, mountain slide and an Olaf figure. · Anna & Elsa Rolling Luggage ($34.95): Gear-up for fantastic adventures and faraway journeys carrying Anna and Elsa's shimmering, gem-covered travel case equipped with retractable handles and rolling wheels. · Frozen Anna & Elsa Singing Dolls by Disney Store ($39.95): Melt the heart of every Frozen fan with these interactive Anna & Elsa Singing Dolls. With a simple wave of your hand, Anna the Ice Princess and Elsa the Snow Queen sing and magically light up in a frosted icy blue glow. · Anna Costume Collection for Girls by Disney Store ($14.95-$49.95): Send her imagination off to a wintry Frozen world of wonder in this Anna Costume Collection, including finely detailed costume with colorful layers of satin and organza covering a black velvet ''bodice'' decorated in flowers, matching boots and golden tiara, each sold separately. 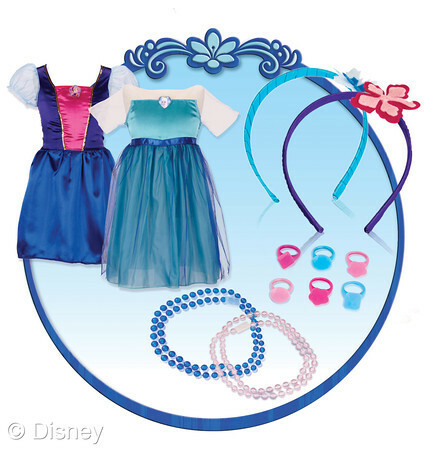 · Anna and Elsa Costumes for Girls by Disney Store ($14.95-$49.95): She'll be the icy enchantress of any masquerade ball in the Costume Collection inspired by Disney's Frozen, including beautifully detailed, glittering costume, matching light-up shoes and silvery tiara, plus wig featuring glittering iridescent highlights and flashing light-up accents, each sold separately. Will Frozen items be on your shopping list?